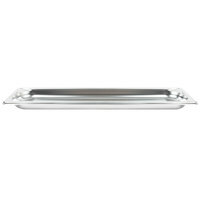 Save energy and money with this Vollrath 30512 Super Pan V® 1/2 size, 1 1/4" deep anti-jam steam table pan! If you operate a high-volume restaurant, cafeteria, dining hall, catering business, or other foodservice establishment, then this Vollrath 30512 Super Pan V® anti-jam steam table food pan is an ideal product for you. 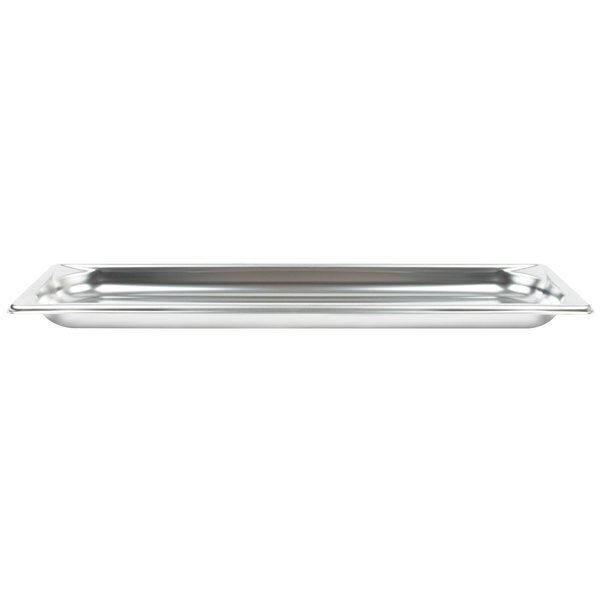 Use this pan to save money in your commercial establishment as it holds and transports food from your kitchen to off-site locations, or use it to present food in your restaurant’s front-of-house serving area. 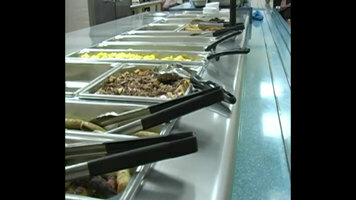 "Vollrath is top of the line. 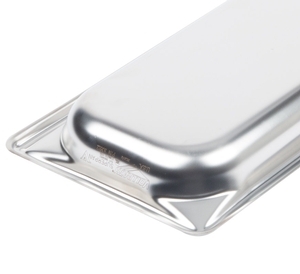 The super pan is a very sturdy product and withstands bending when dropped. It also holds up well to moderate use and washing." 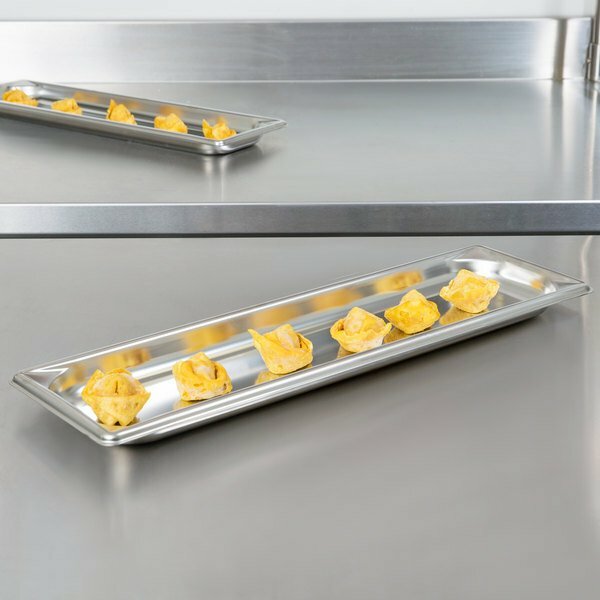 Flattened edges prevent steam from escaping around the pan when it’s in the steam table, giving it a 38% higher heat efficiency than pans with bent edges. 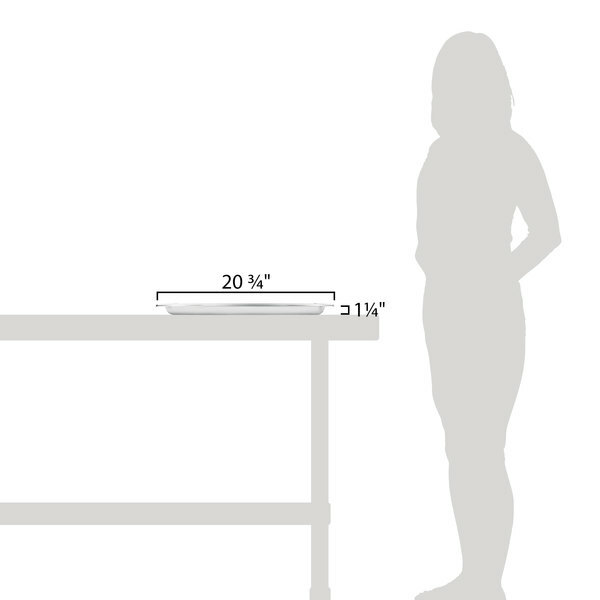 The flat edges are also more comfortable for employees to hold. 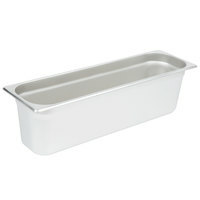 Rounded, diagonally tapered corners make it easier for cooks to pour out liquids and foods into storage containers. 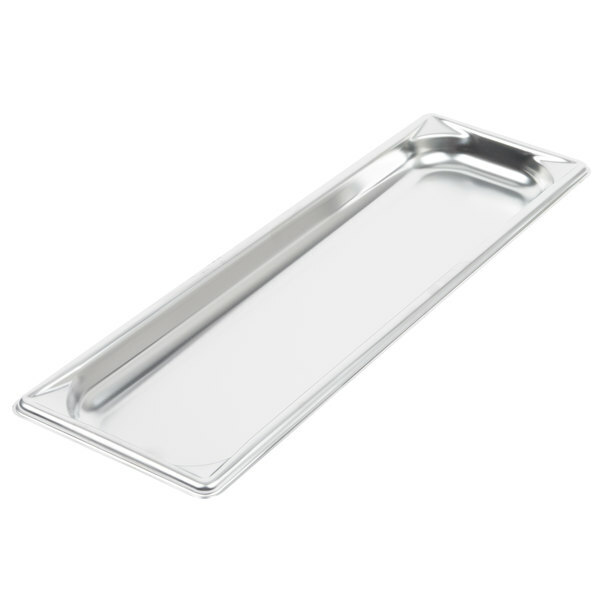 Also, rounded corners allow users to scoop out all food products more easily than from a pan with sharp corners. This Super Pan V® pan includes higher rims which offer more strength, making them dent resistant. This also helps to prevent loss of steam from your food wells, which saves your establishment energy and money. 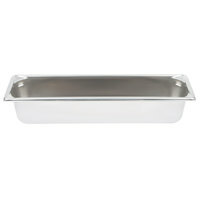 This 1/2 size long steam table food pan is an essential item for any foodservice establishment. Thanks to its 1.9 qt. 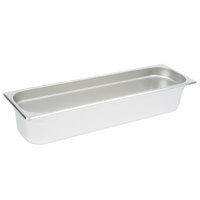 capacity, it’s perfect for holding foods like hand-held appetizers, baked goods, and roasted vegetables. 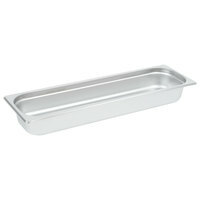 Made from durable 22 gauge, 300 series stainless steel, this pan is built to last through heavy commercial use. 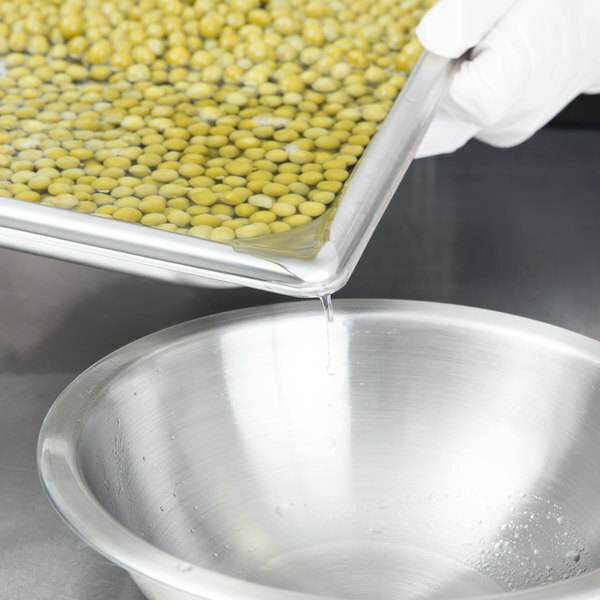 Thanks to this construction, it resists dents and dings in the toughest kitchen environments. 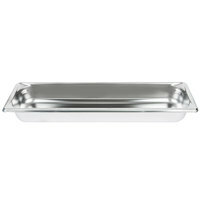 Additionally, this pan’s tapered pour corners are up to 300% stronger than previous models. This pan is resistant to jamming thanks to its patented corner, edge, and rim design. Since it won’t jam, this pan can be stacked when not in use, and cooks can quickly take one off the top of the stack without it getting stuck. 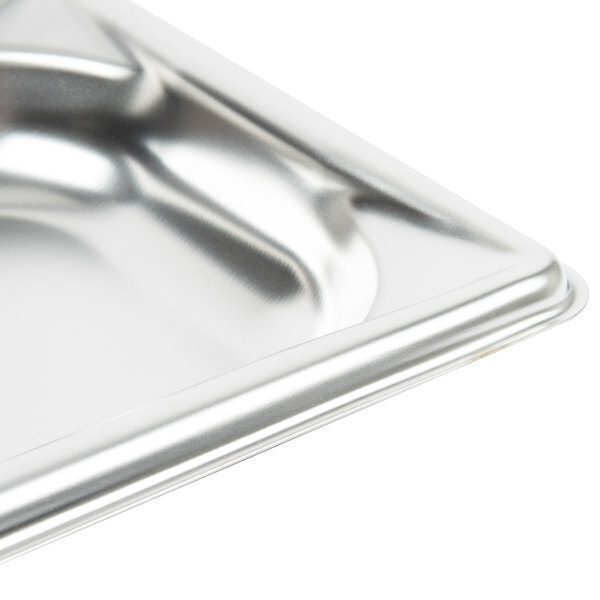 Vollrath's easy pour corners provide superior impact resistance. Plus, they act as a convenient pouring spout to eliminate wasteful drips or spills. 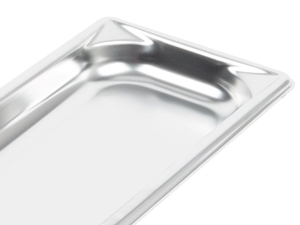 Want to learn the benefits of the durable construction and patented corner, edges, and rim of the Vollrath Super Pan V? Explore that and other features as Chef Rich takes you to Lakeland College for a real world evaluation. Welcome to Vollrath University. 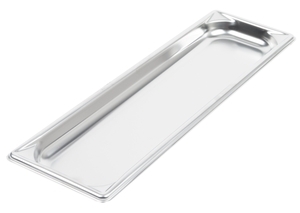 I’m Chef Rich, and today we’re here to talk to you about the benefits of using high quality steam table pans. 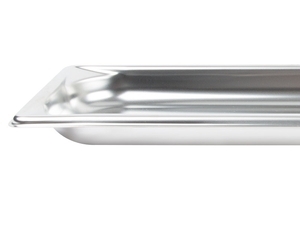 We’ll show you the benefits of a high quality pan in terms of efficiency and also in terms of overall presentation in your food service operation. So now let’s go into a kitchen, and first we’ll show you what a typical pan goes through in a day of operation. As you can see, a pan goes through a lot in a day’s time. In fact, a pan can actually spend more time being transported, washed, stored, scraped, than it actually spends holding food. That’s why you need a quality steam table pan. So let’s head out to Lakeland College, which was one of our test sites in the development of Super Pan V. They’ve been using that pan for about a year now, so let’s just see how it’s been holding up for them. So here we are in the kitchen today with Chef Joe Johnson, the executive chef at Lakeland College. We’re here today to talk about the pans and some other cookware items. So Joe, you’ve been using our new pans for nine months—do you like the way the pans look? Oh, absolutely. I like the finish on them. They hold up really well so you’re not putting out dented pans, which is nice. The steam just comes out if they’re all dented up. When you have them on the shelves do they stack up nice, and is that important? They stack up perfect. In a rush, real easily, it pops right off, you can…no problem. So how important is it that the pan is easy to clean? And talk about the ease of cleaning on the new pans that we have. It’s very important with a high volume like that that they get clean the first time, and with these pans you can get into the corners very easily with a spatula. That corner, too, comes right out. And, it’s one time through the dishwasher and it’s clean. You know, we talked earlier today about the pans and you made a comment to me about the edge and how comfortable a flat edge, or this new pan’s edge, was. Can you talk a little bit about what is it that you feel? We have a pan here that you’re saying isn’t quite so comfortable—that digs into your finger or what did you say to me? Yes, when you’re working, and you’re grabbing the pans all day? This edge does cut into your fingers where the edge on this pan does not with the rolled edge. Ah, another benefit of a flat edge. It’s more comfortable to work with. I noticed your buffet you have set up there looks really nice. Is that important when students come in that that looks nice? Oh, absolutely. We get athletic recruits through and that makes a big impression on them. A lot of the parents comment how good everything looks and how clean it is. I’d like to thank our friends here today at Lakeland College for letting us see their food service operation. 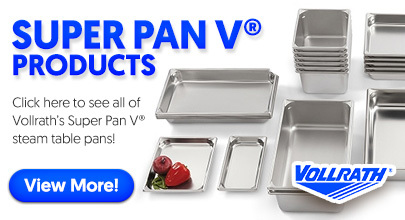 This pan, the Super Pan V, is manufactured from bright annealed 22 gauge 300 series stainless steel, which makes it very durable. Then, the patented corner, edges, and rim are all designed with added strength right where it’s needed most. I’m Chef Rich, and thank you for joining us at Vollrath University. Vollrath is top of the line. The super pan is a very sturdy product and withstands bending when dropped. It also holds up well to moderate use and washing.